Data market is growing fast all over the world. Marketers invest in customer data and this year global data spending will exceed 20 billion dollars. It will grow at a double-digit rate to reach 26 billion dollars in 2019 - our new study reveals. We’ve launched the 2nd edition of “Global Data Market Size” report. It is the only study that analyses international spendings on audience data. The report includes trends, estimates, and forecasts for 23 countries globally for a three-year period (2017-2019). Data-driven economy is not an idea anymore. It’s a fact now and the need for high-quality customer data is greater than ever. Data market grows at a double-digit rate since 2017. Next year it will almost double - from $15.5 B last year to $26.0 B in 2019. This year marketers from all over the world will spend $20.6 B on data. 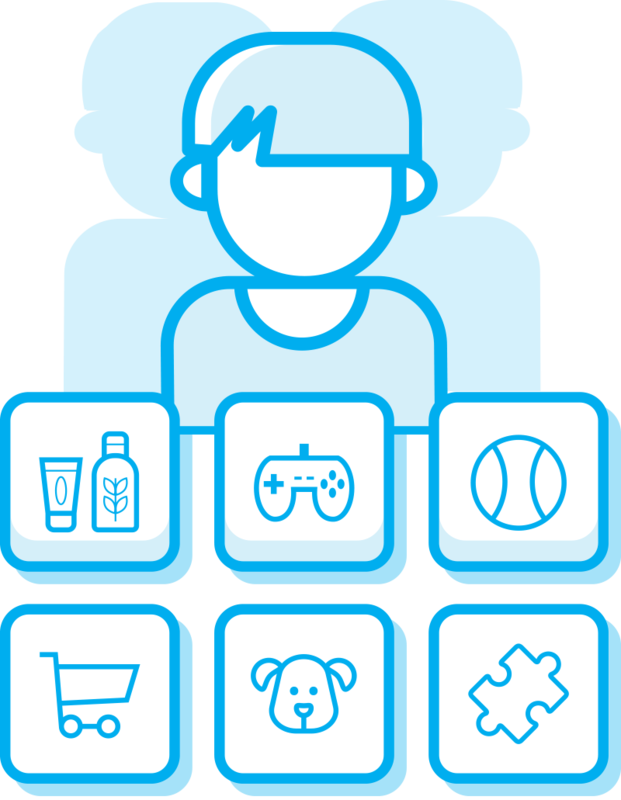 Data spend estimated in the study, includes mainly investments in programmatic advertising, which base on 3rd party data - digital information about customers’ behaviour, interests and purchase intentions. The growth of data-driven companies and development of marketing automation software also plays a significant role in increasing expenditures for data. The better quality of data the more effective are programmatic campaigns. Information about online users’ behaviour and preferences allow marketers to design better products and deliver their clients the right message at the right moment of the buying journey. The value of digital display advertising market will reach $120.8 B globally this year (Advertising Expenditure Forecasts, Zenithmedia.com, 2018), while the programmatic market will hit $75 B, which is a growth of almost 26% YoY (US Programmatic Ad Spending Forecast, eMarketer.com, 2018). Both display and programmatic markets are the petrol that drives the data market and the demand for high-quality data is growing rapidly in almost all 23 countries that we analysed. The largest programmatic markets are also the largest data markets because ads served programmatically needs data. The world’s largest data market in 2018 is the US and it will keep its position in 2019. The US marketers will spend $12.3 B on data this year, which is almost 60% of global data market value. 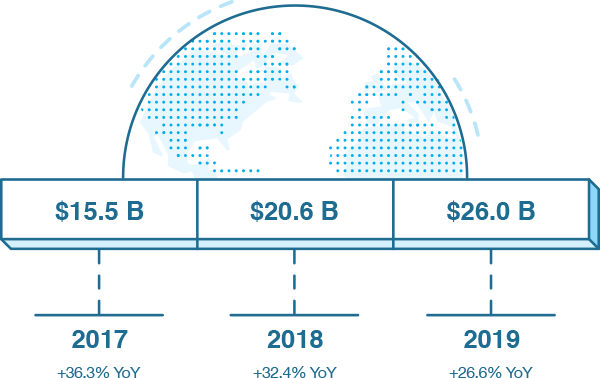 In 2019 the US market will grow by 23.2% and is going to reach $15.2 B.
UK is the world’s second largest data market in 2018 with an estimated value of $1.8 B. It will grow to $2.35 B in 2019 (25.1% increase). 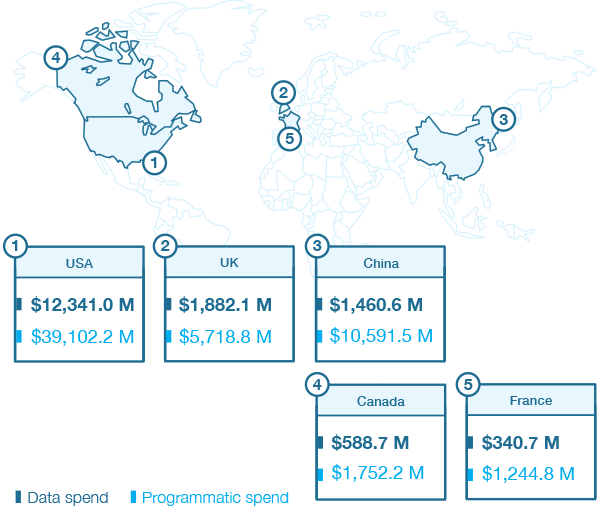 Just behind the UK is China market, where marketers will spend $1.46 B on data in 2018. This market is the fastest growing among the world’s largest data markets (+95.5% YoY) and next year with an estimated value of $2.4 B it will be the 2nd data market globally, overtaking the UK. The world’s fourth data market is Canada ($588.7 M in 2018) and the TOP 5 world’s largest data markets list closes France with an estimated value of $340.7 M this year. Marketers in Europe will spend $3.2 B on data this year, which is over 15% of the global data market. This market is going to grow of 29.8% to reach $4.2 B in 2019. In 2018 the largest data market in Europe is the UK, France took the second place with a value of $340.7 M (+46.8% YoY). Behind France is Germany ($184 M) and the list of TOP 5 data markets in Europe closes Denmark ($114.2 M) and Italy ($64.2 M), which is the fastest growing market among the largest data markets in Europe with a growth rate of 57.8%. Despite the introduction of GDPR, that was widely discussed in the digital industry, data market is still growing fast. Information about customers is a demanded good for marketers. It allows them to increase the effectiveness of online campaigns and receive deep knowledge about clients’ needs. Advertisers invest in programmatic and this market is also growing fast. A month after introducing the new privacy rules, expenditures for programmatic started to recover to pre-GDPR levels. According to Zenith’s report, in 2017 digital advertising market increased by 13.7% and reached $204 B. eMarketers’ study revealed that spendings for programmatic in the US market will grow fast to reach $46 B this year. Estimates in our report also show that both programmatic and data markets are growing rapidly. In almost all countries we analyzed, spending for data in 2019 will grow at a double-digit rate. The trend of using data is stable and has an international reach. The “Global Data Market Size” report is the 2nd edition of the OnAudience.com study. 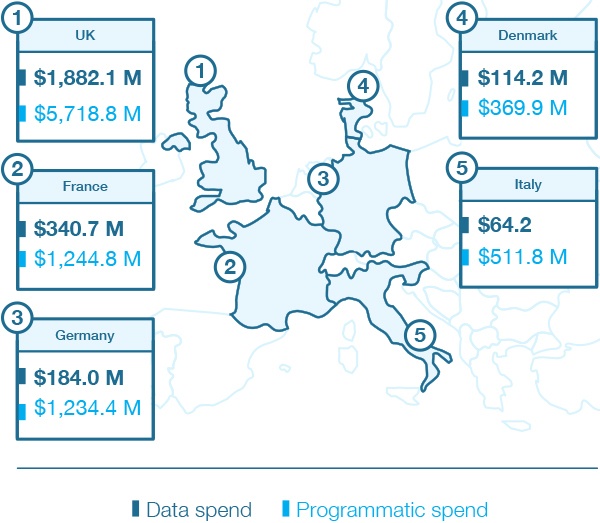 We analysed 23 markets that generate about 90% of the global programmatic spend. In estimating values for specific markets, we used our own data, independent reports (e.g., IAB or eMarketers studies) and applied our own statistical model. In the study, the programmatic market is treated as a part of the display ad market (not including video etc. ), which is a part of the whole digital ad market. The estimation of data market values includes spendings for data that is mainly used for targeting in programmatic campaigns (spendings for 1st, 2nd and 3rd party data and cost of processing data, including costs of Data Management Platforms). Download the report and check estimates, forecasts and trends for data, display and programmatic markets for 23 countries globally.